Most dentists agree that toothpicks should be used sparingly as a method of teeth cleaning and should never be considered a substitute for brushing teeth and flossing. Fact is they should be used only when a toothbrush or floss is not available, for example, when you are in a restaurant and have food trapped between teeth. Toothpicks that are used overzealously can damage tooth enamel, lacerate gums, and even cause a broken tooth in severe cases. People who have bonding or veneers can chip or break them if they aren’t careful. 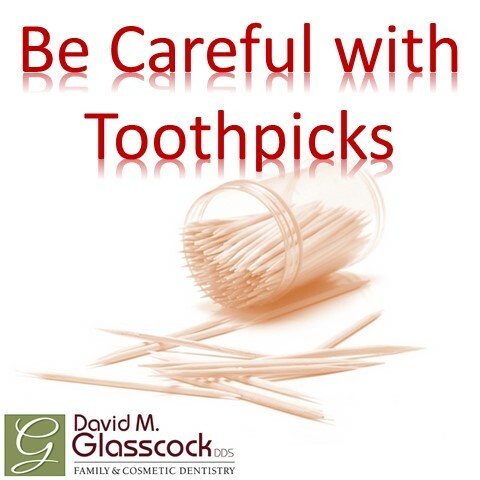 Overly aggressive use of toothpicks can severely wear the roots of teeth, especially in cases where gums have pulled away from the teeth and leave teeth with root surfaces exposed, notably in the elderly. Today, most toothpicks in the United States come from “toothpick trees” in Maine. The tree is a white birch which has its trunk cut into thin sheets that are cut again to the thickness and length of toothpicks. Dentists can tell when they have a habitual toothpick user in their dental chair. There are the tell-tale signs of toothpick marks. So use them if you have too, but don’t make it a habit. Brush and floss instead.